Rohde & Schwarz announced its latest TSA-certified advanced checkpoint scanner, the Rohde & Schwarz R&S®QPS201, was purchased by Denver International Airport (DEN) and deployed to demonstrate next-generation security technology. Rohde & Schwarz presents the new R&S Campus Dashboard designed to manage and remote control the test and measurement instruments in large student laboratories easily from just a single computer. Eta Wireless announced a collaboration with Rohde & Schwarz to support a new digital supply modulation technique that provides power management for the signal bandwidth required by 5G NR and mmWave devices. From April 8 to 11 at NAB 19 in Las Vegas, Rohde & Schwarz will present its latest product portfolio under the motto "Supporting you today. And for the future." At MWC 2019, CommSolid (a Goodix company) will present an IoT reference design integrating its NB-IoT and Bluetooth® SOCs. The manufacturer uses the R&S CMW290 IoT radio communication testers for RF and functional testing of both transmission methods. MediaTek and Rohde & Schwarz are collaborating to perform over-the-air (OTA) tests of MediaTek’s 5G front-end modules and antenna arrays. Rohde & Schwarz will present its test solutions for 5G base stations and the associated massive MIMO antenna arrays and amplifiers at MWC Barcelona 2019. Committed to providing the mobile communications industry with the solutions needed to optimize present technologies and to drive the development of future technologies, Rohde & Schwarz will highlight a variety of its latest wireless mobile testing solutions at this year’s Mobile World Congress in Barcelona. ipoque GmbH, a Rohde & Schwarz company providing market-leading deep packet inspection software, today announced that it will offer demonstrations of its R&S®INTRA solution at MWC19 Barcelona, taking place February 25-28. The new R&S ZNBT40 from Rohde & Schwarz is the first vector network analyzer (VNA) with a broad frequency range from 100 kHz to 40 GHz and up to 24 integrated test ports, and it allows users to perform signal integrity tests in order to check crosstalk or length offset between lines or to detect faults in cables. Rohde & Schwarz has developed a setup that enables 3D RF measurements of antenna characteristics in a temperature range from –20°C to +85°C. Analyzing the frequency response of a device, using Bode plots, is available now for selected Rohde & Schwarz oscilloscopes. Bluetest announces Flow measurement software support for signaling measurements on Bluetooth Low Energy devices using the R&S CMW270 or R&S CMW500 Radio Communication testers from Rohde & Schwarz in combination with any of the Bluetest Reverberation chambers. Test and measurement specialist Rohde & Schwarz, telecommunications service provider China Mobile and mobile platform provider MediaTek have successfully carried out a technical trial of a 5G prototype terminal. As part of the 5G Expert Days at the Rohde & Schwarz headquarters in Munich, Germany, the three companies have planned, implemented and measured an indoor 5G NR network. Autotalks and Rohde & Schwarz validate first ever global C-V2X chipsets. Rohde & Schwarz and Huawei have successfully conducted cellular-based 5G V2X latency measurements in vehicular environments in field tests in Munich and Shanghai. Rohde & Schwarz, today highlighted a portfolio of value class instruments, spotlighting five key technologies. The value instruments portfolio features more than 100 products and 300 accessories including the R&S®RTB2000 Oscilloscope, the R&S®RTM3000 Oscilloscope, the R&S®RTA4000 Oscilloscope, the R&S®FPC1500 Spectrum Analyzer and the R&S®HMP4040 Power Supply. NTT DOCOMO and Rohde & Schwarz joined forces set up the world's first ultra-wideband channel sounder for measuring propagation characteristics up to 150 GHz. The new power supply series consists of the R&S NGE102B with two channels and the R&S NGE103B with three channels. With these new features, Rohde & Schwarz is addressing the educational sector in particular. Rohde & Schwarz and Huawei have successfully tested the interoperability of LTE-V connected vehicles with the R&S CMW500 wideband radio communication tester using the embedded Huawei Balong 765 IC as an LTE-V UE. Rohde & Schwarz introduces additional options for the existing R&S ELEKTRA EMC test software family to cover even more applications. Rohde & Schwarz has expanded its successful R&S Spectrum Rider FPH family with three new base models providing frequency ranges from5 kHz to 6, 13.6 and 26.5 GHz. Rohde & Schwarz and Spirent announced a new partnership to provide an unrivaled, fully integrated test solution, offering full coverage of both the physical and protocol layers for automotive Ethernet TC8 ECU test specifications. Rohde & Schwarz presented its Bluetooth Low Energy (BLE) signaling test solution for signaling RF tests under realistic conditions at Bluetooth World 2018 (Booth #333) in Santa Clara, Calif. on September 18 and 19. At the IFEMA Feria de Madrid, the company is exhibiting its latest measurement solutions for RF and component testing, A&D, radar and 5G NR. In addition, Rohde & Schwarz specialists will be on hand to share their expertise with visitors in numerous free seminars and workshops. China Mobile Terminal Co. Ltd. together with the China Mobile Research Institute, on behalf of China Mobile, signed MoU with 28 partners. Rohde & Schwarz signed the MoU for the 5G Device Forerunner Initiative as a representative of the T&M industry. Rohde & Schwarz offers market-leading test coverage for the certification of eMTC and NB-IoT devices and components. Test cases are validated for test platforms with the R&S CMW500 wideband radio communication tester and the R&S TS8980FTA and R&S TS-RRM conformance test systems. Rohde & Schwarz has further expanded the capabilities of its R&S CMW500 wideband radio communication tester and R&S SMBV100A GNSS simulator to support Global Certification Forum (GCF) protocol conformance tests for C-V2X device certification. The R&S DSA together with the R&S SFD DOCSIS signal generator from Rohde & Schwarz forms a compact test system for performing ranging tests on cable modems to provide information about the signal quality in the upstream direction. System solutions for secure communications from Rohde & Schwarz allow customers to attain information superiority in deployment and digital sovereignty. Rohde & Schwarz is collaborating with PoLTE Corp. to accelerate the robustness and accuracy of cellular location technologies. Rohde & Schwarz has expanded the capabilities of its R&S CMW500 LTE network simulator and R&S SMBV100A GNSS simulator to support critical end-to-end safety-related scenarios for device certification. Boeing and Rohde & Schwarz have reached an agreement to offer Rohde & Schwarz’s next-generation software-defined airborne radio (SDAR) into the flight systems of H-47 Chinook helicopters. Huawei has selected Rohde & Schwarz (R&S) to provide comprehensive testing solutions for NB-IoT terminal chipsets designed by HiSilicon, a Huawei company. Test solutions will extend from R&D to certification and final device production. Rohde & Schwarz (R&S) and Unigroup Spreadtrum & RDA are to establish a joint operator test laboratory in China as part of a memorandum of understanding (MoU) signed at Mobile World Congress in Barcelona. Rohde & Schwarz mobile network testing has signed an agreement with Samsung that grants preferential RF access and support to current and upcoming Samsung devices. Huawei, a leading global ICT solutions provider, has chosen a test solution from Rohde & Schwarz based on the R&S SMW200A vector signal generator and the R&S FSW signal and spectrum analyzer to perform NB-IoT base station tests in line with Release 13 Cat-NB1. The Huawei eRAN 12.0 wireless version is tested using the Rohde & Schwarz solution in compliance with 3GPP TS 36.141. Rohde & Schwarz has successfully demonstrated the generation and analysis of 5G signals based on the characteristics as specified in the Verizon open trial specifications. The R&S SMW200A vector signal generator and the R&S FSW signal and spectrum analyzer both provide outstanding test and measurement capabilities, resulting in an EVM performance of 1 percent when applying these 5G signals. Rohde & Schwarz follows the call to London to attend European Microwave Week, where the company will demonstrate its T&M highlights for demanding applications in the aerospace & defense, automotive and wireless industries. In focus: test solutions for satellite communications, for radar applications in the A&D and automotive sectors and for the next generation of mobile networks 5G. Rohde & Schwarz has enhanced its proven test solution platforms to include advanced capabilities that are facilitating the research, development and standardization of 5G. The fifth generation of mobile radio will open up new frequency bands for commercial wireless communications in the microwave and millimeter wave ranges to increase date rates on a massive scale. Rohde & Schwarz was awarded a contract by the Procurement Office of the German Federal Ministry of the Interior for the latest generation of R&S QPS200 security scanners. The three-year framework agreement encompasses 300 systems plus accessories and service. The new R&S RTO-K44 option from Rohde & Schwarz offers powerful triggering and decoding functionality for debugging designs with MIPI M-PHY based protocols. Defined as a physical layer, M-PHY serves as the basis for a number of protocol standards that have been optimized for rapid data transmission in mobile devices. Rohde & Schwarz has validated six RF conformance test cases for LTE-capable high-power user equipment, allowing the certification of such devices to start. Rohde & Schwarz has introduced the new R&S FSVA, an enhanced mid range signal and spectrum analyzer for signal analysis and demodulation up to millimeter-wave frequencies. The R&S TS8980 RF conformance test system from Rohde & Schwarz is claimed to have achieved the world's first validation for both LTE-Advanced uplink carrier aggregation and LTE-Advanced Pro uplink 64QAM. China Mobile Research Institute and Rohde & Schwarz will cooperate on the evolution from 4G towards 5G within the China Mobile 5G Innovation Center project. The Communications Authority of Kenya commissioned its new spectrum management and monitoring system (SMMS) from Rohde & Schwarz in March 2016. The solution includes both mobile and stationary components, which will be implemented across the country to regulate the frequency spectrum. The R&S BBA150 amplifier family's D series is characterized by high power density and appeals especially to the automotive and wireless communications industry. A desktop model of only four height units delivers up to 200 W.
Rohde & Schwarz presents the R&S RTO2000, the most compact lab oscilloscope for multi-domain applications. When using it to check advanced embedded designs, developers are able to analyze how sophisticated functional units such as power supplies, the processor system and the sensor technology interact. Rohde & Schwarz claims to be the first test and measurement equipment manufacturer to meet the Test Platform Approval Criteria for 3.5 GHz TD-LTE band 42 (TDD42). The R&S Scope Rider from Rohde & Schwarz is equally impressive in the lab and in the field. With an acquisition rate of 50,000 waveforms per second, a 10‑bit A/D converter developed by Rohde & Schwarz and a maximum bandwidth of 500MHz for the analog input channels, this portable oscilloscope clearly outperforms comparable instruments. Rohde & Schwarz has added the new R&S HMO1202 mixed signal oscilloscopes to its R&S HMO1002 oscilloscope family. The new R&S TS7124 RF shielded box from Rohde & Schwarz provides reliable, reproducible measurement results in a shielded test environment, especially during the production of wireless devices. MPI Corp.is partnering with Rohde & Schwarz to provide customers with turnkey solutions for measurements on semiconductor components in the RF and millimeter-wave ranges. Rohde & Schwarz has expanded its range of trigger and decoder options for the R&S RTO and R&S RTE digital oscilloscopes. With the R&S RTx-K50, the oscilloscopes help users debug serial protocols that employ Manchester or NRZ coding. Rohde & Schwarz has validated the first conformance test case described in work item 186 for the IMS-based Rich Communication Suite 5.1 (RCS 5.1). Is Your Handset PA Ready for LTE Device-to-Device Proximity Services? Over the coming year, the Rohde & Schwarz group of companies will fully integrate subsidiary Hameg Instruments GmbH into its Test and Measurement Division. Rohde & Schwarz has successfully demonstrated the performance of the next-generation of Qualcomm® Snapdragon™ LTE modems with three LTE-Advanced demonstrations made publicly available for the first time. The new phase noise analyzer and VCO tester from Rohde & Schwarz enables ultrasensitive and ultra-fast phase noise measurements. The R&S FSWP also allows users to very easily measure pulsed sources and residual phase noise of RF components. Plus the instrument can be upgraded to a signal and spectrum analyzer. The Certification Center Svyaz-Certificate in Russia is now using the Rohde & Schwarz R&S CMW500 to certify ERA-GLONASS systems in line with the TR CU 018/2011 technical guideline. Rohde & Schwarz is presenting a novel 5G channel sounding solution in cooperation with Fraunhofer Heinrich Hertz Institute (HHI) at the NGMN Industry Conference in Frankfurt/Main, Germany, which runs from March 24-25, 2015. Link Microtek has been appointed as a UK reseller for the Value Instruments range of general-purpose test-and-measurement equipment manufactured by Rohde & Schwarz and its HAMEG subsidiary. Rohde & Schwarz will collaborate with Communications Components Inc. to provide operators and test services providers with a comprehensive solution for base station installation and maintenance including PIM testing. PCTEST Engineering Laboratory Inc. (PCTEST LAB), an accredited testing laboratory for wireless testing and certification, has upgraded its R&S TS8980FTA-2 and R&S CMW500 systems to accommodate the new 4G/LTE test plans for industry conformance and carrier acceptance testing. Utilizing the R&S CMW500 wideband radio communication tester, Rohde & Schwarz has successfully verified combining various frequency bands in mixed-mode TDD and FDD mixed carrier aggregation. Rohde & Schwarz presents its new R&S NRPxxS and R&S NRPxxSN USB three-path diode power sensors. The completely redesigned sensors offer unprecedented measurement speed and measurement accuracy, even at low levels. Rohde & Schwarz Asia Pte Ltd and the Infocomm Development Authority of Singapore have signed a Memorandum of Intent to partner Singapore in its vision to transform into the world’s first Smart Nation. With its R&S RTE and R&S RTO oscilloscopes, Rohde & Schwarz is one of the first suppliers to offer analysis solutions for the CAN flexible data (CAN FD) interface protocol. A new option enables design engineers to analyze CAN interfaces that support the high speed CAN FD bus protocol. These interfaces are seeing increased use in automotive and industry applications due to rising data rate requirements. When developing radar sensor chipsets, users can now use the new Rohde & Schwarz solution to simulate a realistic scenario in the lab. For example, it is possible to simulate vehicles with different moving profiles or stress tests in different environments. As a result, developers can verify the signal processing algorithms of the sensor at an early stage. The R&S RTO-K40 MIPI RFFE serial triggering and decoding option from Rohde & Schwarz is a powerful solution that enables developers of RF front ends and modules with RF front end (RFFE) control interface to verify and debug designs and put these components into operation. TEOCO, the leading provider of assurance, analytics and optimization solutions to communications service providers (CSPs), has expanded the testing capabilities of its AIRCOM Device Test Lab with additional test systems from Rohde & Schwarz. Combined with Rohde & Schwarz' extensive conformance and carrier test case support, the R&S TS-LBS Location Based Services (LBS) and the R&S CMW-PQA Performance Test Systems enable TEOCO to support new industry and carrier testing requirements for next-generation wireless technologies, including carrier aggregation, IMS, VoLTE, RCS, E911 over IMS, LTE A-GNSS, LTE OTDOA and LTE eCID. Rohde & Schwarz (R&S) announced that Moog has selected the R&S EDS300 DME/pulse analyzer as a standard test solution for R&D, manufacturing and field deployment of their MM-7000 series navigation aids. The Moog MM-7000 is a technologically advanced full service TACAN and DME Beacon-Transponder that is being widely sold into the civil and military aircraft navigation market. Rohde & Schwarz has expanded the application field of the R&S RTO oscilloscopes to include the testing of automotive ethernet interfaces. General Atomics Aeronautical Systems Inc. and Rohde & Schwarz announced that they have signed a Teaming Agreement to integrate and flight demonstrate Rohde & Schwarz's air traffic control radios on the Predator® B/MQ-9 Reaper® RPA. P3 Communications, a worldwide technical engineering, testing and consulting services company for the telecommunications industry, has selected the R&S PR100 portable receiver from Rohde & Schwarz as their instrument of choice for identifying and eliminating RF interference in 3G and 4G/LTE mobile networks. With units deployed across key mobile markets in the U.S., P3 Communications’ mobile network maintenance and engineering team is able to quickly and effectively identify RF interference negatively impacting customer quality of experience (QoE). In a joint effort, Rohde & Schwarz and Qualcomm Technologies Inc., a wholly owned subsidiary of Qualcomm Inc., have extensively tested the user plane throughput of the new Qualcomm® Gobi™ 9x35 chipset in compliance with 3GPP Release 10 for LTE-Advanced. In the setup on display at Mobile World Congress, the R&S CMW500 wideband radio communication tester from Rohde & Schwarz simulates the LTE-Advanced network. The new R&S RTE from Rohde & Schwarz is available with bandwidths from 200 MHz to 1 GHz. An acquisition rate of more than one million waveforms per second helps users find signal faults quickly. The scope's highly accurate digital trigger system with virtually no trigger jitter delivers highly precise results. The single-core A/D converter with more than seven effective bits (ENOB) almost completely eliminates signal distortion. PCTEST Engineering Laboratory Inc. (PCTEST LAB), an accredited testing laboratory for wireless testing and certification, has purchased a second R&S TS8980FTA-2 conformance test system and several additional R&S CMW500 wideband radio communication testers to cover key next generation technologies. PCTEST's expanded test capabilities support new conformance and carrier acceptance test requirements for IMS, VoLTE, RCS, WiFi Offloading, E911 over IMS, SUPL 2.0, LTE A-GNSS, OTDOA, and eCID. At Mobile World Congress 2014, Rohde & Schwarz will showcase the R&S TSME – a new, ultracompact drive test scanner for today's and tomorrow’s wireless communications standards and frequency bands. The 5th annual LTE Innovation Summit has issued a call for papers seeking presenters from all stages of the mobile wireless ecosystem. The 2014 LTE Innovation Summit will focus on the underlying technologies that are driving the convergence of wireless networks, devices, services & applications. Rohde & Schwarz extends the functionality of the R&S SMBV100A vector signal generator by adding BeiDou/Compass capability to its integrated GNSS simulator. Horizon House publications and Microwave Journal China announced that Rohde & Schwarz will be the Diamond sponsor of the Electronic Design Innovation Conference (EDI CON) 2014 in Beijing, China, April 8-10, 2014. EMITE has included the R&S CMW500 Wideband Radio Communication Tester from Rohde & Schwarz as a supported test solution for MIMO OTA testing. The R&S CMW500 is now fully integrated into the EMITE MIMO Graphic User Interface test software, and has been successfully demonstrated to customers worldwide. Rohde & Schwarz UK Ltd. has been down selected after a 12 month competition process run by BAE Systems to be the preferred partner for the design phase of the integrated communications system for the future Royal Navy’s Type 26 Global Combat Ship. The R&S BBA150 broadband amplifier from Rohde & Schwarz is now also available with a frequency range from 2.5 GHz to 6.0 GHz. The new frequency range is an addition to the already existing range from 0.8 GHz to 3.0 GHz. Thanks to their state-of-the-art design, the amplifiers, which have been optimized for high frequencies, deliver high output power, and are still compact and lightweight. Rohde & Schwarz and its HAMEG Instruments subsidiary now market a range of favourably priced test and measurement equipment bearing the new joint "Value Instruments by Rohde & Schwarz" label. A unique feature of the tried and tested R&S NRP power sensors is their ability to work independently of a specific base unit. The sensors can be connected directly to a PC or laptop via USB. Rohde & Schwarz has now implemented this feature for compact smartphones and tablet PCs as well. Manufacturers and test houses can now use the R&S VTC and R&S VTE video testers from Rohde & Schwarz to test next-generation HDMI sink devices with ultra-HD or 4k screen resolution. This is possible thanks to the new R&S VT-B360 HDMI TX 300 MHz HDMI module, which is equipped with four parallel HDMI channels with ultra-HD resolution. Tests can be performed on TVs, monitors, projectors and A/V receivers with conventional screen resolutions as well. Rohde & Schwarz, a global leader in test and measurement, has expanded its portfolio of solutions focused on the three key aspects that impact mobile network operators’ customer satisfaction: the devices subscribers use, the networks they use them on and the services and applications they use. The R&S SMW200A vector signal generator is the ideal tool for generating the high-quality, complex digitally modulated signals required for the development and verification of today's communications systems. Rohde & Schwarz, a leading manufacturer of audio, video and telecommunications test equipment, announced that it is collaborating with Dolby Laboratories Inc. to provide audio test technology to Dolby and its licensees. New bandwidths, mixed-signal analysis and options for testing USB interfaces, CAN LIN buses and audio signals: Rohde & Schwarz significantly expanded its oscilloscope portfolio in 2012. At the embedded world 2013 trade fair in Nuremberg (hall 4, booth 112), the company will present its latest applications, two new probes and other state-of-the-art products. In addition to various new options for its oscilloscopes, Rohde & Schwarz has continued to expand its range of probes as well: Available for the first time on the market, there is now a broadband, ground-referenced model with a range up to 6 GHz. A differential high-voltage probe is also available. Electronics company Rohde & Schwarz is known for innovative products and pioneering technology. The company is also moving ahead in communications and design, and its new website has been launched. Rohde & Schwarz now offers harmonic filter options for its R&S SMB100A microwave signal generator. These filters make it possible to achieve a harmonic suppression of more than –50 dBc over a wide frequency range from 150 MHz to max. 40 GHz. At low frequencies below 3 GHz, it is even possible to achieve an excellent –58 dBc. Rohde & Schwarz has enhanced its fully integrated R&S SGS100A by adding a model for I/Q modulated signals from 80 MHz to 12.75 GHz. Combined with an I/Q baseband generator, the instrument can be used to generate test signals for all radio standards in this frequency range. As a result, the R&S SGS100A is ideal for X-band signals from 8 GHz to 12 GHz for radar and satellite communications. The I/Q modulator's wide RF bandwidth of 1 GHz makes it possible to generate pulses with high chirp bandwidths and steep pulse edges. A highlight at the Rohde & Schwarz booth at the electronica trade fair in Munich, Germany is the new R&S ESR EMI test receiver. Thanks to its broadband architecture, it performs standard-compliant disturbance measurements up to 6000 times faster than other solutions. At European Microwave Week in Amsterdam (hall 3, booths 115/216), Rohde & Schwarz will present highlights from its test and measurement products for microwave applications. In addition, experts from Rohde & Schwarz will impart their expertise to attendees of nine workshops and seminars covering various microwave applications. Rohde & Schwarz's new R&S ESR test receiver is available in two different models for frequencies ranging from 10 Hz to 3 GHz or 7 GHz to meet the requirements of all users who perform EMC certification on commercial equipment. The Rohde & Schwarz R&S FSW-K6 pulse measurement option for the R&S FSW series of high-performance signal and spectrum analyzers is an excellent choice for evaluating the performance of radar systems and all other applications that employ pulsed signals. When coupled with the MultiView capabilities of the R&S FSW series, multiple spectrum analyzer measurements can be run, viewed, and updated on a single screen giving the user a complete overview of system performance. Rohde & Schwarz has added three new options for its compact R&S DST200 RF diagnostic chamber: the R&S DST-B160 automated 3D positioner, the R&S DST-B210 cross-polarized test antenna and the R&S DST-B270 communications antenna. The new options significantly speed up precompliance testing of wireless devices, allowing automated test sequences to be performed on the lab bench so that developers no longer require constant access to large RF test chambers. The Rohde & Schwarz ETC mid-range, multistandard TV analyzer supports the ISDB-T, DVB-T and DVB-T2 digital terrestrial standards. Rohde & Schwarz has added new functionality to its R&S SMU200A vector signal generator: Equipped with the R&S SMU-K77 option, the R&S SMU200A simulates dynamic fading scenarios for testing military radiocommunications equipment. This makes it possible to verify the performance of military radios and optimize their hardware to enable smooth operation under harsh receiving conditions such as dynamic fading and multipath signal propagation. The latest Rohde & Schwarz test solution for LTE is based on the R&S CMW500 wideband radio communication tester with new options and the R&S UPV audio analyzer. The R&S CMW500 emulates an LTE network and the R&S UPV assesses the voice transmission and voice quality of the LTE user equipment according to an objective set of test criteria. The new 4 GHz high-performance oscilloscope from Rohde & Schwarz with its 20 Gsample/s sampling rate addresses a wide variety of applications. Utilizing Single-Ended to Differential Insertion Loss (SET2DIL) algorithm for validating high-speed differential transmission line performance on printed circuit boards (PCB), the Rohde & Schwarz (R&S) ZNB network analyzer is a high-performance network analyzer that provides a wide dynamic range with high accuracy, short measurement time and ease of use. Test and measurement products from HAMEG Instruments are now directly available from Rohde & Schwarz almost anywhere in the world, which has prompted the decision to brand these products with a new logo that contains the names of both companies. This move is intended to further increase the brand awareness and growth of HAMEG Instruments and within the next three months, the dual logo will be introduced in nearly all regions. When network operators upgrade to LTE they want to take full advantage of their new and existing resources, so to support this objective, Rohde & Schwarz has added MIMO-specific measurements to its R&S ROMES4.65 drive test software. Using this feature, the R&S TSMW network scanner can quickly identify interferers that reduce MIMO performance in LTE networks. China Mobile is using the R&S CMW500 wideband radio communications tester from Rohde & Schwarz in its Research Institute labs to perform RF tests on user equipment for time division LTE (TD-LTE). The intention is for Rohde & Schwarz’s TD-LTE cooperation with the Chinese mobile radio network operator to continue on a long-term basis. The potential for WiMAX technology is driving its development at a pace aimed at effective mass deployment. This article outlines the requirements necessary for the development of specific test procedures and equipment. Rohde & Schwarz' R&S CMW270 wireless connectivity tester allows developers to test the RF characteristics of WLAN 2x2 MIMO stations in line with the IEEE 802.11ax standard. The R&S®ZNLE makes vector network analyzer measurements easy to configure, easy to calibrate, easy to measure. It is ideal for basic VNA applications. With its solid RF performance, light weight and small footprint, the R&S®FPL1000 spectrum analyzer combines the functionality of a benchtop instrument with the portability of a handheld instrument. The R&S®FPC1500 is the only spectrum analyzer on the market that has a spectrum analyzer, vector network analyzer and signal generator all-in-one instrument. It has resolution bandwidth down to 1 Hz, built-in VSWR bridge, one-port VNA with Smith chart display and more. Rohde & Schwarz has significantly expanded and optimized its R&S VENICE platform for live production, studio production and channel playout applications. R&S VENICE offers absolute stability and an enormous range of features. Its flexibility makes it a future-proof investment. Rohde & Schwarz is expanding its oscilloscope portfolio with the R&S RTM3000 and R&S RTA4000 series. Their first-in-class, 10-bit vertical resolution enables power measurements fulfilling the more stringent requirements demanded by advanced electronics. The R&S RTA4000, is ideal for analyzing serial protocols, even offers an acquisition memory depth up to 1 Gsample. The RTM3000 oscilloscope offers bandwidths of 100 MHz, 200 MHz, 350 MHz, 500 MHz and 1 GHz. Rohde & Schwarz is extending the functional range of its R&S SMW200A vector signal generator to include the DVB-S2 satellite standard and its extension DVB-S2X. The R&S SMW200A with the new option provides a simple solution for testing components, devices and satellites that support these standards. It is said to be the first single-device solution on the market to generate DVB-S2/DVB-S2X signals not only as IF signals below 6 GHz but also on transmission frequencies in the Ku-Band and other microwave bands up to 40 GHz. Manufacturers who want to integrate wireless modules into their products now face completely new test requirements. The US's largest wireless network operator is the first to publish specific test plans for IoT integrators. In response, Rohde & Schwarz announces the availability of its new R&S TS 290 IoT carrier acceptance test system, which is based on these test plans. Claimed to be the only test solution of its kind, it offers RF, protocol and performance test cases in a single box. The R&S ELEKTRA EMI test software has been designed for easy and intuitive EMI measurements during product development. It supports EMI test receivers and spectrum analyzers from Rohde & Schwarz. Even development engineers or technicians who only occasionally use these instruments to measure electromagnetic interference are able to configure automated test sequences quickly, often right in the development lab, using GTEM cells or line impedance stabilization networks (LISN). 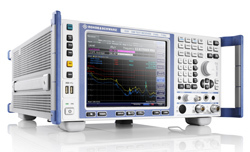 Rohde & Schwarz introduced a modular probe system for precision measurements up to 9 GHz. The R&S RT-ZM probe system used in combination with a Rohde & Schwarz oscilloscope is an excellent solution for easily and precisely measuring fast signals. It offers a maximum bandwidth up to 9 GHz, a DC offset range of ±16 V and the MultiMode function that allows users to switch between test modes without recontacting. The R&S RTO2000 model with 6 GHz bandwidth allows developers to test the radio interfaces of 802.11ac WLAN components for IoT modules in the 5 GHz band as well as fast communications interfaces such as USB 3.1 Gen 1 with data rates of 5 Gbit/s. Thanks to its multi-domain functionality, only a single compact instrument is needed to analyze power supplies, processors and sensors with up to 6 GHz bandwidth. The R&S NRPM OTA power measurement solution is the first solution for measuring transmit power over the air interface for 5G and wireless gigabit components. The solution enables users working in development and production to calibrate the output power of the antenna on a DUT and to test the DUT's beamforming function. Base stations, access points, wireless devices and radio modules use phased array antennas to transmit 5G and wireless gigabit radio signals. Beamforming is used to control the direction of radiation of the transmit antenna in order to maximize the power level at the receiver. Rohde & Schwarz has introduced the R&S FSVA, an enhanced mid range signal and spectrum analyzer for signal analysis and demodulation up to millimeter-wave frequencies. Users benefit from the features of this instrument in all measurements up to 40 GHz where low phase noise, high sensitivity and wide analysis bandwidth are required. R&S FSVA offers a 160 MHz analysis bandwidth over its entire frequency range. The new R&S TS7124 RF shielded box from Rohde & Schwarz offers the best shielding effectiveness, the largest interior dimensions and the most flexible antenna configurations in its class. It provides reliable, reproducible measurement results in a shielded test environment, especially during the production of wireless devices. Unique in its class, the R&S TS7124 offers shielding in excess of 80 dB at 6 GHz. Its frequency range from 300 MHz to 6 GHz. R&S CMW290 functional radio communication tester from Rohde & Schwarz is the right solution for users who want to integrate wireless modules into their platforms and test them. For end-to-end testing of applications, the R&S CMW290 can simulate a cellular network and set up a connection between the application on the device or system and the server. IMS server, audio or eCall/ERA-Glonass functionality are also available for the R&S CMW290. The R&S FSWP phase noise analyzer and VCO tester from Rohde & Schwarz enables ultrasensitive and ultra-fast phase noise measurements. It also allows users to measure the spectral purity of signal sources such as generators, synthesizers, high-end oscillators (OCXO, DRO, …) and voltage-controlled oscillators (VCO) more quickly than with any other solution. The high-end instrument covers a frequency range up to 26 GHz and offers a top dynamic range. The completely redesigned R&S NRPxxS and R&S NRPxxSN USB three-path diode power sensors offer unprecedented measurement speed and accuracy, even at low levels. The sensors enable 10,000 triggered measurements per second with a minimum trigger resolution of 100 µs. A special mode permits 50,000 equidistant measurements per second. The improved design decreased the lower measurement limit to -70 dBm, resulting in a very wide dynamic range of 93 dB. With its new microwave frequency options, the R&S SMW200A vector signal generator supports development applications requiring complex multichannel scenarios up to 40 GHz. It is the only instrument on the market to combine a baseband generator and RF generator with fading, AWGN and MIMO capabilities in a single box. It can be used for radar and satellite component and module tests as well as for future 5G technology development. Rohde & Schwarz has expanded its family of R&S RTE oscilloscopes to include two- and four-channel models with 1.5 and 2 GHz bandwidth. The T&M expert now offers the broadest selection of products in this class, with bandwidths ranging from 200 MHz to 2 GHz. Customers can utilize the full bandwidth of an instrument on all available channels simultaneously. Rohde & Schwarz has been continuously enhancing its R&S IQR100 digital I/Q data recorder. A new firmware update now provides users with a data rate of nearly 100 Msample/s instead of the original 66 Msample/s. The R&S IQR100 digital I/Q data recorder from Rohde & Schwarz can now record, store and play I/Q signals with bandwidths up to 79.6 MHz -- loss-free in realtime. With the addition of the new R&S SGU100A RF upconverter, Rohde & Schwarz expands its tried and tested R&S SGS100A vector signal generator to cover microwave applications. The combination of the two instruments yields the most compact vector signal source on the market up to 20 GHz. The R&S SGU100A is available as a pure CW upconverter or as an upconverter for I/Q-modulated signals. Rohde & Schwarz has expanded the frequency range of its R&S SMW200A high-end vector signal generator to 20 GHz. The R&S SMW200A is the only instrument on the market to combine a baseband generator, RF generator and fading simulator in a single box. The SMW200A makes it possible to generate two wideband signals with any type of modulation up to 20 GHz using a single device. The new Rohde & Schwarz transmitters feature outstanding efficiency, compact design and flexible configurations. They fulfill the demands of the market in the best possible way. The Tx9 transmitter portfolio now covers the frequency bands II, III, IV and V.
Looking for a vector signal generator to master even the toughest challenges? The R & S® SMW200A represents the very best of today’s possibilities. It is the perfect tool for creating high-quality complex digitally modulated signals, for instance when developing new broadband communications systems, verifying 3 or 4 G base stations or for the aerospace and defense sectors. Rohde & Schwarz has doubled the analysis bandwidth of its high-end R&S FSW signal and spectrum analyzer from 160 MHz to 320 MHz. The R&S FSW is currently the only signal and spectrum analyzer on the market able to process signals in this bandwidth. This gives the analyzer a competitive edge in a variety of applications related to wideband digital communications and radar systems. R&S RTO features an impressive low-noise frontend, high dynamic range ADC, high acquisition and analysis rate and a digital trigger system with extremely low trigger jitter. In addition to automatic jitter measurements, the R&S RTO-K12 jitter analysis option offers a wide range of intelligent functions. Power analysis requires that users measure voltage and current. For this purpose, Rohde & Schwarz offers high end voltage and current probes and now also the new R&S RT-ZF20 deskew fixture. The deskew fixture makes it easy to measure delay differences, which can then be corrected in the oscilloscope. Rohde & Schwarz adds the R&S BBA150 for the microwave range to its EMC portfolio. These compact, lightweight amplifiers with their state-of-the-art design are optimized for high frequencies starting at 0.8 GHz. Depending on the setup, the R&S BBA150 can be manually operated via its display and buttons or it can automatically control via a remote control interface or a web browser. A product must pass the USB Implementers Forum's compliance tests (USB-IF compliance program). Rohde & Schwarz meets this need with the R&S RTO-K21 USB 2.0 compliance test software for its R&S RTO high-performance oscilloscope. This software offers scenarios for testing USB 2.0 devices (DUT) when functioning as a device, host or hub. World’s first Voice over LTE (VoLTE) test solution for audio quality measurements demonstrated at LTE North America 2011. Rohde & Schwarz presents the R&S ZNB with four test ports and a second internal generator. Users who need to characterize multiport DUTs, mixers and amplifiers will benefit from the extremely wide dynamic range, short measurement times and exceptionally easy operation. Rohde & Schwarz products redefine network analysis with wider dynamic range, short measurement times and superior ease of use. The R&S SGS100A signal generator has been optimized for use in automated test. All the new features are aimed at delivering maximum flexibility for the mobile radio industry. Now also fit for connectivity and initial broadcasting standards. Cost-efficient R&S UPP audio analyzer family reduces measurement times in production environments. New coaxial power sensors, R&S NRP-Z56 and R&S NRP-Z57, are the first to perform thermal power measurements up to 67 GHz. Compact and modular solution from Rohde & Schwarz simplifies complex measurements in network analysis. Rohde & Schwarz presents new 67 GHz vector network analyzer with the world's highest dynamic range. New R&S ESCI7 EMI test receiver from Rohde & Schwarz for standard-compliant disturbance measurements up to 7 GHz. Rohde & Schwarz makes debut on the broadband amplifier market with state-of-the-art technology. R&S SMA100A signal generator: one-box solution for configuring and analyzing complex pulse trains. Sets new standards in signal purity and output power up to 43.5 GHz. Flexible multistandard platform from Rohde & Schwarz handles wireless measurement tasks of the future. Rohde & Schwarz simplifies TV component measurements with an innovative combined network and spectrum analyzer. Rohde & Schwarz offers the world's first network analyzer with four-port architecture up to 50 GHz . The R&S SFE100 test transmitter from Rohde & Schwarz targets production test applications for set-top boxes, TV sets, and other broadcast terminal units and modules. This signal source's compact design makes it easy to install – especially in complex test systems. Up to now, measurements on balanced components had to be performed in a roundabout way: Network analyzers were only able to mathematically calculate the differential parameters from unbalanced single measurements. With its new analog R&S SMF100A microwave signal generator, Rohde & Schwarz is setting new standards for single-sideband (SSB) phase noise. With the new R&S NRP-Z81 broadband power sensor, Rohde & Schwarz is expanding its product range of USB-capable power sensors. The R&S FSU67 from Rohde & Schwarz extends the upper frequency limit in spectrum analysis from 50 GHz to 67 GHz. Rohde & Schwarz today announced the R&S SMB100A analog signal generator that offers the best combination of performance, ease of use, and serviceability of any instrument in its price range. Rohde & Schwarz has now expanded the high-end Network Analyzer R&S ZVA by the software option for pulsed measurements. The R&S ZVA-K7 enables pulse profile measurements on semiconductor components and antenna/radar systems. The R&S ZVA40 from Rohde & Schwarz is a new network analyzer with a frequency range from 10 MHz to 40 GHz. This high-end instrument allows you to perform measurements on passive and active components as well as antenna measurements in radar/satellite applications. The R&S ESU from Rohde & Schwarz is a new family of CISPR16-1-1-compliant EMI test receivers that meet all civil and military standards for electromagnetic interference measurements. A new FFT-based test method speeds up the measurement. With the R&S FSUP, Rohde & Schwarz offers for the first time an instrument that is specially designed for measuring phase noise and for characterizing RF signal sources. Equipped with the R&S SMx-K49 option, the Signal Generators R&S SMU200A, R&S SMATE200A and R&S SMJ100A generate signals in accordance with the IEEE 802.16-2004, IEEE 802.16e-2005 and WiBro standards. Today's microwave and wireless communications market is expanding at an incredible rate, thus increasing the need for test equipment that will help verify the performance of devices and systems. A flexible tool for a broad scope of applications is the signal generator because of its wide frequency range, high output power and variety of modulations. For example, signal generators with a minimum frequency of 9 kHz permit applications in EMC measurements. Frequency coverage up to 12.75 GHz covers ISM bands as well as all important mobile radio bands. Microwave signal generators may cover or support frequencies up to 20 GHz, 40 GHz and even 110 GHz. This Application Note describes testing S-parameters under pulsed conditions. A constant power level calibration is included. A LDMOS S-band radar power transistor is used as example DUT. The pulse profile mode of the R&S ZVA is used to analyze the time-dependent behavior of the DUT. This application note provides an application program for level alignment, test automation and reporting with PESQ and POLQA on the Audio Analyzer R&S UPV or R&S UPV66. An introductory section explains theoretical background, gives application hints and defines requirements for test signals. IQWizard is a tool for loading IQ signal files in various formats and measuring IQ signals with a FSx spectrum analyzer or ESx Receiver. The obtained IQ data in memory can be stored in various formats or be transmitted to an AMU / SMU with WinIQSIM™ or WinIQSIM2™. This application note presents the I/Q Software Interface (R&S K11 option) of the R&S RTO in the context of remote applications. It demonstrates the basic operation, application examples, and an analysis in MATLAB. The scope of the subject “radar” has expanded in the recent years in terms of its technical evolution and spreading of applications. This application note along with its corresponding white paper 1MA207 show how to use the R&S radar product portfolio to tackle test and measurement tasks in modern radar technology. Target groups are students who want to become familiar with radar issues as well as radar professionals who want to solve certain test and measurement tasks. This document describes how a Windows®-based R&S® T&M instrument is remotely operated by an Apple iPad* as if working on it locally. Step-by-step procedures are provided for setting up and configuring the T&M instrument and the iPad. On the iPad, a special App implements the Windows® "Remote Desktop" functionality. T&M instrument and iPad are connected via WLAN (also denoted as Wi-Fi network). Due to its outstanding performance the R&S SMW200A vector signal generator is ideal for testing MIMO receivers in a vast variety of applications offering maximum usability at minimum form factor. It can generate up to eight antenna signals simultaneously in its digital baseband – all standard-compliant and with antenna-specific coding. In addition, it can simulate the complete MIMO transmission channel with up to 16 fading channels, sufficient to emulate higher-order MIMO configurations such as 3x3, 4x4, and 8x2. Rare faults and intermittent signals are difficult to capture. The R&S®RTO Oscilloscope supports the acquisition and the detailed signal analysis of these signals by using the history mode. The history mode allows the user to look back to previous acquisitions and apply the wide set of analysis functions of the RTO. Furthermore it stores the accurate recoding time of the waveforms for subsequent analysis. The aim of this application note is to provide information regarding Rohde & Schwarz instrument drivers. This paper shall help application engineers and software developers to easily get an understanding of advanced techniques to develop test and measurement (T&M) applications by utilizing Rohde & Schwarz instrument drivers. Furthermore the nomenclature used for Rohde & Schwarz instrument drivers will be explained. Multiple Input Multiple Output (MIMO) is an integral part of LTE. Vector signal generators and signal & spectrum analyzers from Rohde & Schwarz support LTE measurements with up to 4 antennas. This Application Note covers 2x2 MIMO in the LTE downlink. Remote control programming is demonstrated by examples for a free-of-charge program. Performing a multi-port calibration of a vector network analyzer (VNA) is straight forward by using either a calibration unit with the corresponding numbers of ports or single calibration standards. This paper shows how to perform a n-port multi-port calibration by using calibration unit with a lower number of ports than available of the vector network analyzer. Nearly all tests in accordance with the Bluetooth low energy test specification V4.0  can be performed using the R&S® CBT alone. Some tests additionally call for signal generators to provide interference signals. This application note describes the tests performed with additional equipment and presents straightforward solutions based on the R&S® CBTgo software. Nearly all tests in accordance with the test specification* can be performed with the R&S® CBT alone. Some tests additionally call for signal generators to provide interference signals and also require spectrum analyzers. This application note describes the tests performed with additional equipment and presents straightforward solutions based on the CBTgo software. The oscilloscope is arguably one of the most useful tools ever created for use by electronic engineers. In the more than five decades since the modern analog oscilloscope was created, hundreds of useful documents and thousands of articles have been written about what it is, how it works, how to use it, and application-specific examples of the oscilloscope in action. It is the purpose of this primer to instead describe digital oscilloscopes, which have for practical purposes replaced their analog predecessors in the vast majority of applications. This White Paper provides a general overview of different military and commercial radar systems. It also covers some typical measurements on such systems and their components. This white paper presents the basic idea behind software defined radio (SDR) and provides an overview of the Rohde & Schwarz radios and further details of SDR test and measurement solutions offered by Rohde & Schwarz. Near Field Communication (NFC) is a new short-range, standards-based wireless connectivity technology, that uses magnetic field induction to enable communication between electronic devices in close proximity. Based on RFID technology, NFC provides a medium for the identification protocols that validate secure data transfer. NFC enables users to perform intuitive, safe, contactless transactions, access digital content and connect elec­tronic devices simply by touching or bringing devices into close proximity. This White Paper gives an overview of NFC uses, NFC technology and signals, RF measurements on NFC units and shows some examples of measurement results using R&S test instruments and special R&S NFC software tools. New wireless applications demand ever increasing data rates from both cellular and noncellular networks. To satisfy these needs in noncellular networks, the IEEE 802.11 (WLAN) standard - the most commonly used standard for wireless local area networks today - is continually being extended. This application note discusses WLAN standard IEEE 802.11n. It first describes the most important amendments to previous releases and the ambitious new measurement tasks. Then, it describes how to deal with these tasks using Rohde & Schwarz instruments. The main focus here is on transmission over several TX and RX antennas (MIMO). Building multistandard signals using Rohde & Schwarz generators is also described. Screenshots from the analyzer taken on 802.11n signals complete the document. Multiple input multiple output (MIMO) technology is an integral part of 3GPP E-UTRA long term evolution (LTE). As part of MIMO, beamforming is also used in LTE. This white paper discusses the basics of beamforming and explains the eight MIMO transmission modes in LTE Release 9. The LTE technology as specified within 3GPP Release 8 was first commercially deployed by end 2009. Since then the number of operators implementing the technology is strongly increasing around the globe. LTE has become the fastest developing mobile system technology. The same way GSM and WCDMA have been enhanced with additional features over time, LTE is continuously worked on. Initial enhancements have been included in 3GPP Release 9 and are described in this white paper. TETRA, the TErrestrial Trunked RAdio, is the professional mobile radio standard (PMR) used world wide by governmental safety and security authorities and organizations, as well as by private utilities from energy suppliers through to transport. Rohde & Schwarz provide test instruments idealy suited for both the development and production of TETRA base stations and user equipment, as well as for network planning, network coverage and quality of service, network monitoring and optimization, maintenance, and service. This Application Note shows examples for measurements with R&S instruments covering the entire range of TETRA test requirements. This White Paper provides a general overview of different military and commercial radar systems. It also touches some typical measurements challenges on such systems and their components.There is a complementary application note, a new version of the 1MA127 which provides information on radar test and measurement to the main target groups A&D and Automotive. Addtionally it provides an overview of core radar-related products from Rohde & Schwarz. The measurement speed for spurious signal measurements is mainly defined by the spectrum analyzer sweep speed. With traditional swept spectrum analyzers and tight spurious limits the measurement can easily take hours or even a full day. This application note describes the differences in sweep speed between swept spectrum analyzers and modern spectrum analyzers with a wide-band FFT process, and how this improves the measurement speed for general spurious measurement. This Application Note describes the differences in intermodulation distortion measurements between traditional spectrum analyzers with analog narrow-band IF signal path and modern spectrum analyzers using a wide-band IF signal path and digital RBW filters. This document describes the highlights of LTE scanning functionality of TSMW. In an FAQ style, it explains briefly the background of LTE and leads to the important measurements that have to be done in a proper network roll-out. Nearly all tests in accordance with the Bluetooth low energy test specification V4.0  can be performed using the R&S®CBT alone. Some tests additionally call for signal generators to provide interference signals. This application note describes the tests performed with additional equipment and presents straightforward solutions based on the R&S®CBT go software. POLQA® (Perceptual Objective Listening Quality Assessment) is the next-generation mobile voice quality testing standard according to recommendation ITU-T P.863 and has been especially developed for the super wideband requirements of HD Voice, 3G, VoLTE (4G), VoHSPA and VoIP.